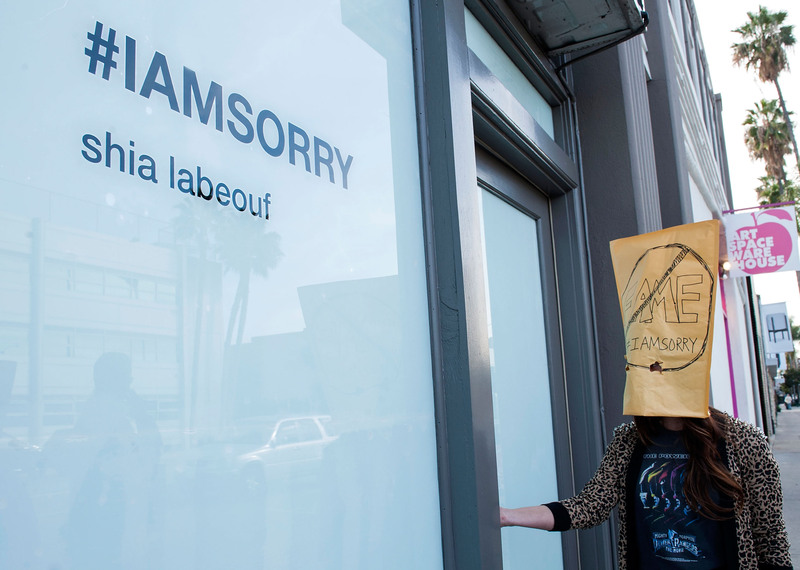 I Went to Shia LaBeouf's #IAMSORRY Exhibit in L.A., But What Does it All Mean? The mood on the street was a weird one. On the quiet stretch of Beverly Boulevard between Martel and Fuller there were two lines forming. One for Shia LaBeouf's Marina Abramovic-style rip-off art piece #IAMSORRY, and another for a Walt Disney animation exhibit. The Disney line was far longer. Considering LaBeouf's mouse house origins (on the series Even Stevens), one could almost read far too much into the situation, as if choosing between LaBeouf's past and this intolerable future he's establishing for himself. Either way: things were pretty diametrically opposed. As I popped into line at 10 of 4, I was surprised and a bit relieved to hear reports that the queue's abbreviated length were, in fact, true: there were about 20 people or so ahead of me. Maybe I would make it into this weird mess after all. The entire #IAMSORRY event was a bit calamitous in that there were, seemingly, no rules. No time limits for folks who entered to see the star, and no way to know when people were leaving. There were plenty of random folks skulking around, a few drivers in cars yelling out "what's this line for?" (two of them didn't even know who LaBeouf was — impressive in the industry town of L.A.), and more than a couple girls dressed to the nines attempting to get special treatment and/or access. And, of course, plenty of cameras — some from the likes of local news and OMG! Insider's Michael Yo, others less conspicuous in origins. All in all, a super-L.A. affair. Everyone in line had an opinion on the matter — and by and large they were less than positive regarding LaBeouf himself. "He messed up and now he's trying to redeem himself by calling it all art," explained a woman we're calling Kat. "I think he's taken it too far," mused Maria (also not her real name). Kat and her friend Maria had skipped out of school early to take part in the affair. When I asked if they were fans of LaBeouf's, they grimaced slightly, "I guess I used to be. I dunno anymore," Kat said. They were nearly the youngest people in a line filled with the usual suspects: entertainment industry types, youngish hipster-y looking comedians, several entertainment journalists, a few twenty-something girls who seemed at least nominally interested in art — and a married couple who brought their two young daughters with them. I was, of course, fascinated by their presence. Would the wee ones be allowed in to look upon LaBeouf? Would they have to go in by themselves or with their parents? And how would that go? Would he keep his schtick up, even with these two adorable (and energetic!) little girls wandering around him? I imagined them trying to wrangle the bag off of LaBeouf's head and making it a plaything of their own. An hour into the wait and the line hadn't moved. In fact, I had been the last person in line for much of that hour: it was only in the latter 15 minutes of my waiting that two men joined in behind me. Considering it was nearly 5 p.m. and the exhibit closed at 6, I was beginning to realize that I might not make it in at all. Yo and his crew had left for awhile — after excitedly running towards the back alley exit of the gallery (did they get in to talk to him?) — but returned at the tail end of the evening to take photos. Everyone, it seemed, knew someone who'd already taken their turn, and were swapping stories. "It was weird," explained one fellow to another. "It was way more awkward than I anticipated," said another. An employee from BuzzFeed (whose offices are oh-so conveniently across the street from the exhibit) explained that it made him uncomfortable. In fact, "uncomfortable" was the sentiment that reigned supreme over most people's experience with the event. Several folks nodded in agreement when LaBeouf's gaze was described as "intense." The well-publicized tears were also a topic of discussion. I asked the folks standing around me what they thought the whole thing was about. The overwhelming consensus was that nobody seemed to get it. But everyone seemed to believe that they would, somehow, understand exactly what LaBeouf was doing with all of this — if they just got their few minutes time with him. As if staring into his paper-bag covered face would reveal some hidden truth to the madness. Finally, at 5:51, many people realized that their time with the star was not going to happen. At that point more than half the line left, pushing me up slightly farther than I was before. I decided to stay until the end, just to see if anything weird happened. It didn't. And as 6 p.m. came and went, the line petered out uneventfully. All in all, I saw 5 people enter the exhibit in the two hours I was in line. Whatever the case, the overwhelming consensus is that it's gone on far too long, and exhausted its novelty. But still, people are talking about it, and so the media reports on it, and the Sisyphean cycle of it all continues. Is he sorry? I don't think so — I doubt that's really the point. But Whatever LaBeouf decides to do next, if given the choice, I might just pick the Disney line instead.